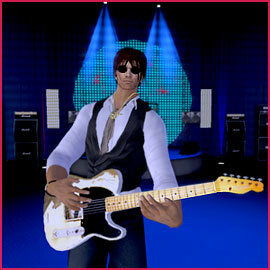 A professional, working musician and songwriter from Denver, Colorado, his avatar Ganjo Mokeev streams live music performances into the hugely popular online virtual worlds of Second Life® and InWorldz ™ . Ganjo combines his RL performing experience and his natural talent into a bluesy, funky, romantic good time! His sets incorporate live guitar and live vocals over recorded backing tracks (he plays all the backing instruments himself), which creates a groove that is sure to get your rump shakin' and your feet movin'! Don't miss the chance to check out the shows! He writes and arranges his own original songs, as well as arrangements of cover tunes. He has been playing guitar, bass, and drums and singing for over 30 years and has quite a bit of experience in many styles of music, but prefers music with funky backbeats and strong rhythmic grooves. Blues and Funk get him going! His first CD "Rough Mix" was released in 2000. His second CD "It's Like This" was released in 2009. His third CD "Six String Drive" was released in 2012. His fourth CD "Struttin" has just been released in 2015.